1. Mix all salad ingredients with salt then squeeze lemon over the top. Set aside. 2. Heat 2 tbls of vegetable oil to medium heat. Add turmeric and chilli powder for 30 seconds, making sure it is fully absorbed into the oil. 3. Add prawns and fry until they turn pink (about 4 minutes). Remove prawns with a slotted spoon and add to the top of the salad. 4. Add the other tbls of vegetable oil and bring to a high heat (almost smoking). 5. Cook the seeds and garlic until the seeds pop (this will only take a few seconds). 6. Pour the oil mixture over the prawns. You can keep back the seeds if you prefer as it’s the taste from the oil you want. Top with coriander leaves. 7. 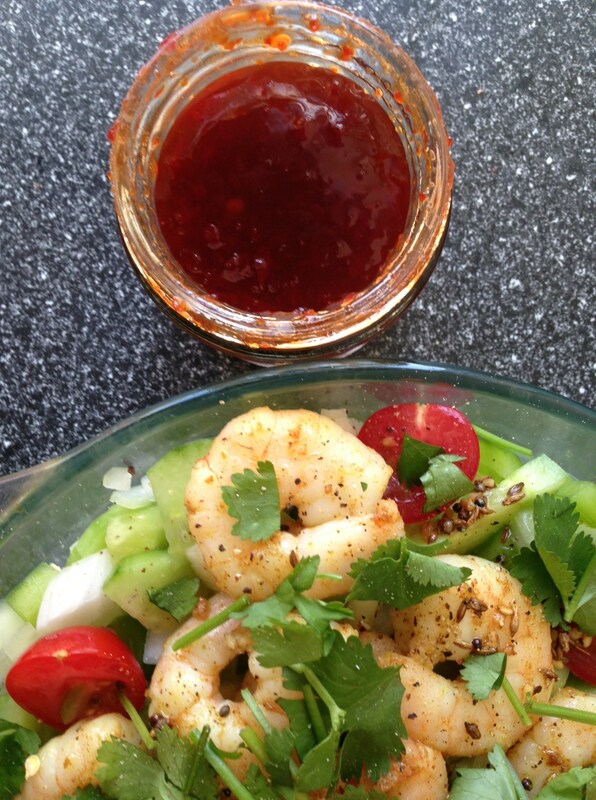 Serve with a chilli jam as a dipping sauce. I used Bhut Jaloka Chilli Jam from the Chilli Jam Factory. • A full range of chilli jams from the Chilli Jam Factory are available from Lockie’s Shellfish.